“Biblical History and the Generations” from Christian Faith Publishing author Harold Bates is a wonderfully detailed and eclectic study of biblical history that looks far and wide into historical events in order to place geographic locations and pinpoint specific eras, tying in different cultures that were developing with and influencing the stories in the Old and New Testaments as they stand known today. “Biblical History and the Generations”: a wonderfully detailed recounting of biblical events from a historical-philosophical perspective. 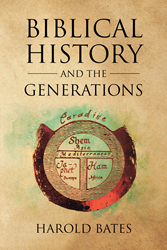 “Biblical History and the Generations” is the creation of published author Harold Bates, a retired medical biologist. Published by Christian Faith Publishing, Harold Bates’s new book is a unique take on the richness and interconnectedness of events that happened as far back as 4241 BC in Africa, tracing to the era of the new church with Peter’s diary, the only witnessed firsthand account of the ministry and resurrection of the risen Christ. Bates writes with a matter-of-fact wonder and appreciation for the historical backgrounds and cultural contexts of the Bible’s many stories, and this is the sense that permeates the text to infect the reader with the same awe for the unfolding of this great epic in humanity’s history. View a synopsis of “Biblical History and the Generations” on YouTube. Consumers can purchase “Biblical History and the Generations” at traditional brick & mortar bookstores, or online at Amazon.com, Apple iTunes store, or Barnes and Noble. For additional information or inquiries about “Biblical History and the Generations”, contact the Christian Faith Publishing media department at 866-554-0919.